Easy to make, these canapés can be ready in less than 10 minutes. 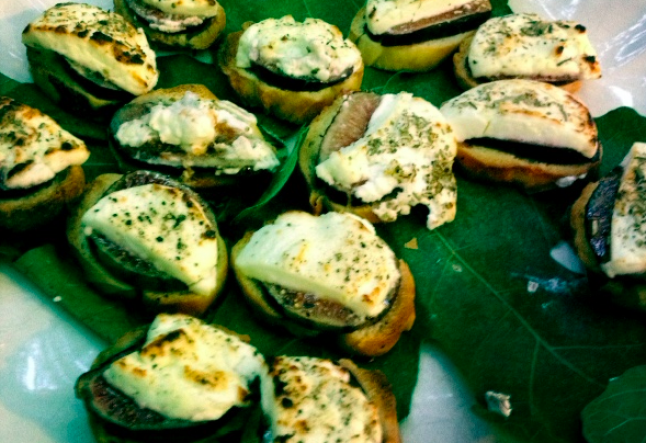 Slice a few pieces of bread, place a finely cut slice of fig and a teaspoon of goat cheese on each slice of bread. Drizzle olive oil, thyme and pepper (to taste) on top of the goat cheese and grill at 220°C for 4-5 minutes. Serve hot from the oven. Enjoy! Notes & tips: You can serve these canapés with a green salad (mash or rocket preferably) and turn it into an entree.